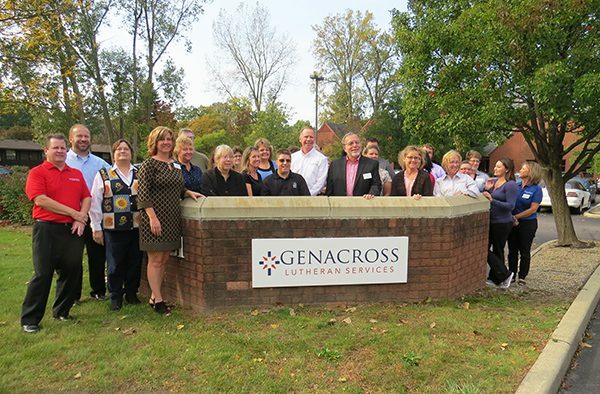 In a morning ceremony unveiling a new sign at its Ministry Support (corporate) office, Lutheran Homes Society, one of the area’s largest nonprofit providers of senior housing and services, officially changed its name to Genacross Lutheran Services. The name change came about after months of research and planning. The name, which was approved by the Board of Directors late this summer, acknowledges the fact that the 156-year-old organization, which began serving orphans and then seniors, has expanded its care and services in order to remain a viable and effective provider in today’s changing health care environment. “Today, Genacross Lutheran Services touches the lives of people of every age, across many generations,” Mr. Marshall explained. The organization’s services include youth care and treatment, family counseling, home health, inpatient and outpatient therapy, mental health counseling, community services, affordable housing, adult day services, and senior living options. Genacross Lutheran Services continues to operate under the same leadership and with the same Board of Directors. The organizational structure has not changed, and the organization maintains the support of the Evangelical Lutheran Church in America, the Lutheran Church—Missouri Synod, and nearly 170 Lutheran congregations across the region. Genacross Lutheran Services, formerly known as Lutheran Homes Society, has been serving and inspiring people in need since 1860. Today, nearly 3,600 people of all ages throughout northwest Ohio and southeast Michigan benefit from Genacross programs and services that foster compassionate care and wellness in many areas of life. Genacross Lutheran Services is a nonprofit, Christian organization that employs more than 1,000 people and is supported by nearly 170 Lutheran congregations across the region. For more information, please visit GenacrossLutheranServices.org.